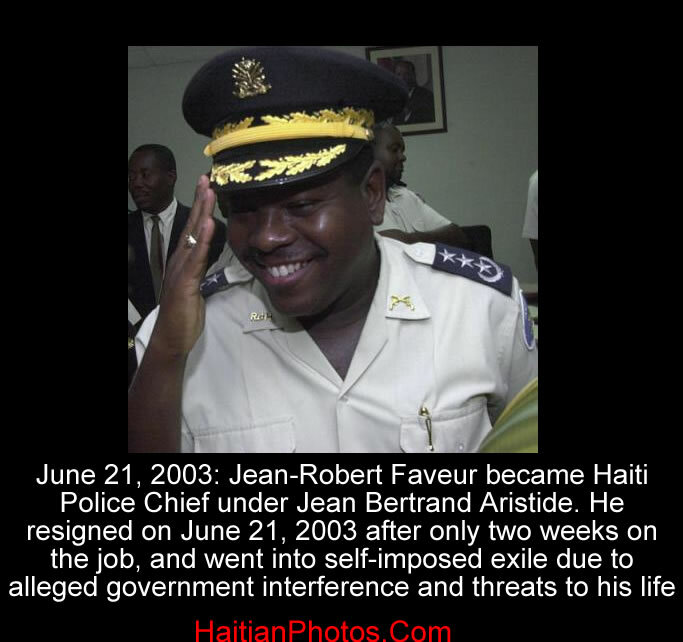 June 21, 2003: Jean-Robert Faveur became Haiti Police Chief under Jean Bertrand Aristide. He resigned on June 21, 2003 after only two weeks on the job, and went into self-imposed exile due to alleged government interference and threats to his life. In the midnight of Sunday, June 22, 2003, Jean-Robert Faveur, Haiti's former Police Chief fled the country with his family because he felt his life is under threat. He resigned from his office and fled to Miami because of the Haitian government's efforts to undermine the autonomy of his office curbing every operational and financial control. He said President Jean-Bertrand Aristide was filling police ranks only with people loyal to him regardless of their qualifications. They had neither served long enough in their posts nor passed competitive examinations for promotion as the rules demand. The government officials claimed that his departure was preplanned. Since he was a choice of the Organization of American States to lead an efficient police force to hold a credible election under President Aristide, his sudden departure was meant to jeopardize the entire process. However, Faveur said he used his own money to flee. Never received any assistance from any embassy or anyone.